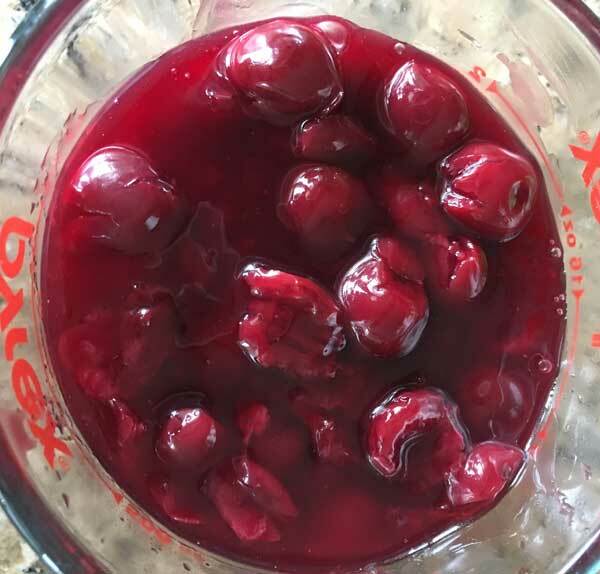 Cherry season will be here soon enough, but if you have a jar of Dark Morello Cherries hanging out in your cabinet and want to put them to good use, here’s a basic cherry pie filling and topping. You can use this for many things including a free-form cherry tart, which is what I made yesterday. They’re not exactly gorgeous, but free form tarts are tasty, don’t require a pie dish, and go well with vanilla ice cream. I’ve included the tart recipe in the notes. Drain the cherries, separating the juice and the cherries. You should have 2 cups of cherries and well over a cup of juice. Measure out exactly 3/4 cup liquid (that’s all you’ll need). In a large saucepan (2-3 quarts), combine the sugar, cornstarch and salt. Add the 3/4 cup of cherry juice and stir until smooth. Place saucepan over medium heat and whisk or just stir until mixture boils, thickens and becomes translucent. Remove from the heat and stir in the drained 2 cups of cherries, almond extract, lemon juice and the butter (if using). Chill until ready to use. For sauce, you can leave out the butter, but if you are using the filling in cherry tarts or pies, the butter gives the filling a little more body. In a mixing bowl , mix together flour, sugar, and salt. Cut the butter into bits or grate it with a cheese grater and scatter it over the flour. With a pastry cutter or your fingers, mix until coarse. Add cold water a few tablespoons at a time and stir, pushing all dough toward the center, with a heavy duty scraper until dough holds together. Press into two tight balls (or one large one if making one large crostata), wrap in plastic and chill for at least half an hour or until ready to use. To make a small to medium size tart, set one section of dough on a floured surface. Let it sit at room temperature just until it is soft enough to roll. Roll into an 8 inch square and transfer to a parchment lined rimmed baking pan. Spread a thin layer of egg wash over the circle. Spoon about 1 cup of the cherry mixture in the center of the circle, leaving about a 2 inch border. Bring borders of circle up and over the edge of the perimeter of the cherries so that the crust covers just part of the cherries and pinch the edges. It will look like a square, but the edges will probably come apart a little during baking. Brush crust with more egg wash and sprinkle with sugar if desired. Bake at 425 degrees F for about 20 minutes or until golden brown. Let cool for 30 minutes to an hour before serving. This recipe yields enough to make 2 small tarts or one fairly large. The small tarts serve 2-3 (or 4 if you accompany with ice cream) and the large tart should be double. Here's a tip from Karen, who made the recipe and left a comment: Roll out both dough circles before you fill them. That way you can divide the cherries evenly. I had a couple jars of Morello cherries and happen to find this recipe and am glad I did. I doubled the recipe and it was delicious. I did add a little vanilla with the almond extract. I had to make a gluten free crust but it was pretty close to your recipe. It is a great recipe. Thank you. I’m so glad it worked out for you. And thanks for the tip about rolling the dough! I’ll copy it and add it to the recipe. I made this crostata with a jar of Morello cherries from Aldi. It was outstanding. Followed the recipe exactly except used my food processor to make to dough for the crust. Turned out perfect. One tip would be to roll out both dough circles before you fill them. That way you can divide the cherries evenly. I did one first and shorted it on filling then the 2nd had too much… Live and learn…. Thank you for your thorough response. I will proceed exactly as you suggested. You have pleased my whole Thanksgiving family group; I just know it! Great question! In fact, I just baked a pie using the filling. Here’s a link to the most recent recipe. This particular pie has a crumb topping rather than a second crust, so it comes together pretty quickly. Now if you just wanted to wing it and build you own pie using this filling, my advice would be to use an uncooked pie crust, fill it with the cherry filling, top with a lattice (if not using a crumb topping) and bake at 375 degrees for about 40 minutes on a preheated cookie sheet. Also, if the pie is deep dish or anything larger than 9 inches round, you might need to double the filling. The tart sounds wonderful. How do I adjust this recipe for pies? Do I cook the (homemade) pie crust before filling it and cooking it (at what temperature). Cool! I will look for that chocolate if and when they come to town! Good luck getting an Aldi. They have really good prices on eggs, milk and produce. They also have inexpensive but good chocolate bars called Choceur. Sonya, I think Aldi owns Trader Joe’s or the family that owns Aldi owns both. I’m not sure, but they are related and some of the products are similar. I love both stores. 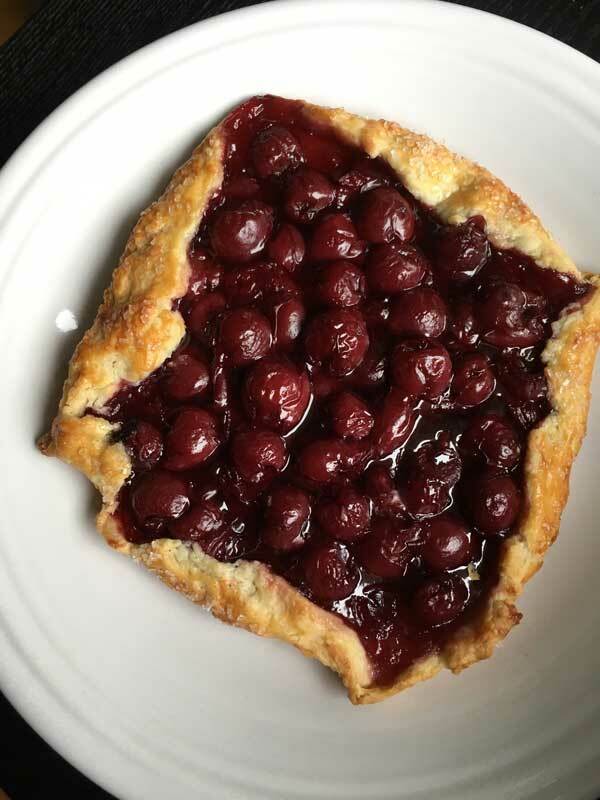 We don’t have an Aldi’s yet, but cooks Illustrated tried a bunch of cherries in pie and found that the Morello cherries from Trader Joe’s were the best. They didn’t mention Aldi’s which perhaps are the same or similar? Anyway, they are tasty! I got these at Aldi, but I think they are pretty much the same as Trader Joe’s. are these the cherries sold by trader joe’s? Agreed! I didn’t need any food coloring, though. I used the ones from Aldi and they liquid is already bright red. Yes – these are some of the best cherries you can use for pies! They hold up extremely well under baking, taste great, plus you don’t need to pit any cherries! If desired to improve the color, you can add a drop or two of red gel food coloring.